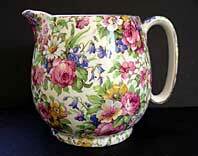 "A lovely early Grimwades Royal Winton Ware art deco jug with all over chintz Summertime pattern. 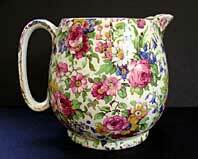 This round Paris shape style jug and matching range of pieces, was known as the Globe shape by Royal Winton. The pattern number for Summertime with gold trim is 775 and was first introduced in 1932. 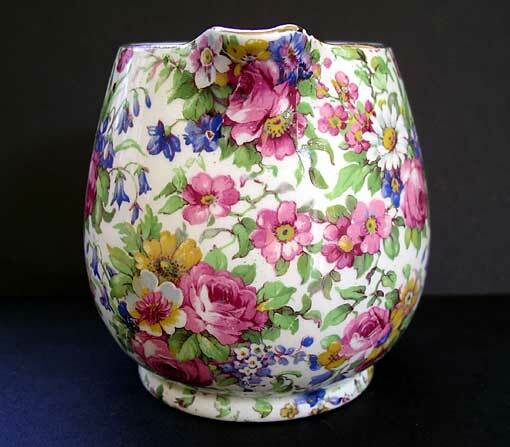 Summertime was the second mainstream, marketed, chintz pattern to be introduced by Grimwades following the success of Marguerite. 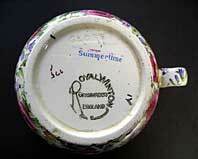 A lovely collectable example of early pre-war Grimwades Royal Winton chintz Staffordshire pottery." Antiques Expert Hamilton Bear. Dimensions: width 116 mm max. height 90 mm max. Marks: Full range of marks as illustrated. Condition: A good display item. Condition report: There is flat chip to the inside edge of the spout rim which has been filled. Faint short trace hairline to inside of jug extending down near handle. This is easily missed and does not show on the outside pattern side. Pattern is good without fading. 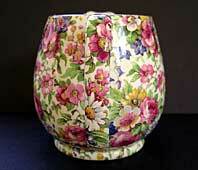 Strong bright colouring to a good decorative piece.